With the PS4 launch out of the way, Sony is getting back to business releasing new PS3 and PS Vita content. FIrst of all, one of the best Soulcalibur games in Namco Bandai’s weapon-based fighting series has been enhanced and re-released for the PS3 complete — with online play. We also get the stylish Stick It To The Man for the PS3, Aquapazza for fighter fans, and more. The Last of Us fans can pre-order the recently announced Left Behind DLC already as well. The PS4 does get NBA Live 14 for those in the market for another next-gen basketball title. 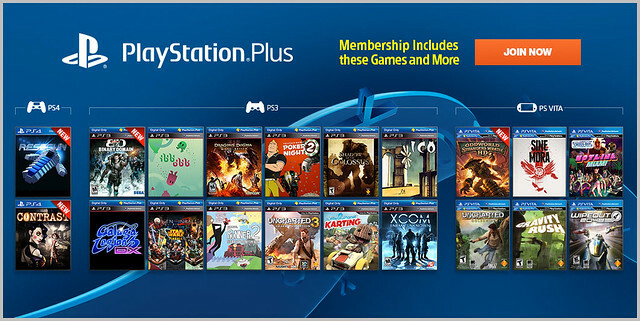 PS+ subscribers can download Binary Domain (PS3) and Oddworld: Stranger’s Wrath (PS Vita) for free too. Read on for everything available this week. Pre-Order The Last of Us: Left Behind. A familiar face returns as new light is shed on an essential relationship in the story of The Last of Us. Naughty Dog continues to explore the themes of survival, loyalty, and love in their first ever single player DLC with The Last of Us: Left Behind. – The Last of Us American Dreams Issue #1 digital download code from Dark Horse Comics. Welcome to the largest and most exciting farming simulator ever made! Farming Simulator will challenge you to take on the role of a modern day farmer. Animal husbandry, crops, sales… It’s up to you to manage and grow your own farm in two huge environments: typical European and American environments. Princess Bubblegum summons Finn and Jake to investigate a rash of thefts and kidnappings that have plagued the Candy Kingdom. She thinks the cause lies within her Secret Royal Dungeon, where only the nastiest monsters and criminals are locked up. If they’ve found a way to escape, the Land of Ooo will be in danger! Show creator Pendleton Ward teams up again with developer WayForward in an all-new action game! Select from fan favorite characters from the show, including Finn, Jake, and many more, and team up with your friends in four-player co-operative multiplayer as the Adventure Time world comes to life through beautiful pixel animations, and voiceover from the original cast. What is AquaPazza? Legend speaks of an amazing magical power that would grant its controllers’ desires, but what happens when such an influential power is misused? Choose from 13 main characters and 13 support characters to fight in a world corrupted by powerful magic in this uniquely illustrated, wildly entertaining, all-out fighting game. Use flashy combos, partner attacks, and high emotion to restore balance to the world! Decide the battle for the future of Argaan! The empire of Myrtana is in turmoil: The power-mad king has set out to conquer the southern islands – no matter the cost. In these troubled times you suddenly find yourself in the middle of civil unrest and war – all centered around a mysterious, ancient power. Through turn of fate you have been granted the first insights into the source of this power… but what to do now? Confront the enemy’s superior strength and regain your honor after you, the glorious vampire hunter, have been turned into a vampire yourself. Launch devastating attacks by combining your vampire skills with the powerful strikes of your swords. The Dynasty Warriors series is reborn. The power of the next gen consoles is used to create the look and feel of a modern kung fu action film. Battle against thousands of soldiers in more immersive environments where players can swim, climb and use the landscape to make a raid on the hordes of soldiers swarming the battlefield with innovative and unpredictable Tactical Action objectives blend seamlessly fast and intuitive melee combat to become history’s greatest warrior. CONTRAST is a platform/puzzle game where you can move between a fantastic 3D world and a mysterious shadowy universe in 2D. You play Dawn, the imaginary friend of a young girl named Didi. Together, they will delve into a dreamlike and surreal 1920s world, inspired by the performance art world of vaudeville and film noir, and cradled by a jazzy atmosphere. On an ordinary day, hard hat tester Ray has a bizarre accident and wakes up with a giant pink spaghetti arm sticking out of his brain, giving him extraordinary mind-reading powers. Ray can suddenly change the world with stickers, transforming his paper universe by tearing it, folding it and using the crazy stickers he finds (along with his awesome new powers) to solve mind-boggling puzzles! Sadly, Ray doesn’t have much time to get to grips with his new-fangled psychic abilities. Instead, he’s on the run from ‘The Man’ for a crime he didn’t commit. Can you help Ray out of this sticky situation? The Legend will never die. Heralded as one of the best fighting games of all-time, SOULCALIBUR®II returns to consoles with crisp new high definition graphics and all-new online modes in celebration of its 10 year anniversary. Set shortly after the events of Columbia Pictures’ new film, The Amazing Spider-Man throws New York City’s brand new hero back into free-roaming, web-slinging action, as he protects the Big Apple from a deluge of unimaginable threats.